dling some religous satire at revengeofthedoor.wordpress.com. check it out, submit stuff, comment, etc. I do agree that praise is to be given to the One that died for us. But it is not up to us to determine how that praise is to be given to Him. That is the work of the Holy Spirit in each individual heart. That is the secret of true praise. If that is in traditional hymns and songs and etc.......then for that individual that is true praise. If that is in contemporary christian music and etc.......then for that individual that is true praise. We must be careful throwing out what we deem as proper praise to be given to God it is not for us to determine. I for one choose not to make that choice for others. I only want what His will is and nothing else. Hey check out MC Yogi. He rocks over any of these guys. I realize that expert opinion and fact will not carry much weight in this cesspool of idiocy, but anyone who has studied education will tell you that repetition is extremely effective in helping people remember things. And if part of the purpose of worship music is to teach theology (as the article seems to indicate, criticizing contemporary songs for not having deep concepts in them), then why SHOULDN'T they be repetitive? If it helps a person remember the song, and therefore remember the scriptural truth within the song, a certain amount of repetition should be regarded as a good thing. Hey Paterson ... WTF? you sound like my great-uncle who'd whinge about this stuff along with the price of milk. Y'know not EVERYTHING the church needs to be ripped on is this ham-fisted, indiscriminate way. Honestly, would you rather today's kids be praising like it's 1699? Gimme a break! THE part that made me LOL "and the overhead projector may flash several pages of text until the correct one is arrived at. Don't panic, this is normal. Just continue singing as though you know the words and soon either the correct slide will appear or a new chorus will begin." ITS TRUE!!! I am 29 and a child of the 80's (im also a U2 fan), been to Calvary related churches most of my life and EVEN I have favorite hymns (and even like old classical pieces like Handel's Messiah) and songs I wish they still sang in church...but I do think being raised around the emerging CCM, and being into Christian punk, metal, rock,alt, secular music with spiritual themes made me have an negative attitude when I come across a bible study where they only sang hymns. I think Perhaps that had more to do with most of them were written by written by Witness Lee and Watchman Nee of the LOCAL CHURCH which I was told is rather a cultish group of churches but I don't know I liked the actual READING the bible study time.....Yeeeaaa I'll stick with Calvary I cant help it I prefer drums, bass and guitar wailing or GOSPEL choir with my worship. Wow! A musical interpretation of the trinity! Read William Sargant's 1957 book 'Battle for the mind: a physiology of conversion and brainwashing'. Repetition is all about mind control. "Man looks at the outward appearance, but GOD looks at the HEART". my rule of thumb would be if I become convicted by the Holy Spirit through the worship/music/hymn/song does it bring in the Word of God to a point to have Truth realized, or is it so void of Christ and emotes warm, gushy feeling, which will not sustain but a moment after it is sung. If we find ourselves singing about who we are, rather than who He is, we are but merely in the world, in the flesh, as spoiled children who probably have little or nothing to do with sacrificial love for any one but ourselves. makes growing in to Lord focused on "what have you done for me lately?" I wish someone would debate these points: Is it possible that CCM has moved from worship through the music to worship OF the music? Is it possible we are confusing a mystical experience (which can be generated even in pagan ceremonies) with worship? There are plenty of reasons to criticize CCM. None of them are in this article. I suppose the point I was trying to make was we (I) shouldn't let pride slip into our thought process when it comes to the arts. Some people may prefer water colors over acrylic. One isn't right and the other one wrong. I wouldn't even say that one is better than the other. I may not like calypso music, or salsa, but that doesn't make my preference better than someone else's'(that pride issue). So, I am not about to cast a stone at someones style of art, as long as it is done with excellence and the proper motivation (praising God). I HAVE BEEN IN CHURCH MUSIC FOREVER AND FINALLY AM ABLE T0 PARTICIPATE IN A GOOD BLENDED WORSHIP SERVICE. IT BOTHERS ME LIKE CRAZY TO WITNESS THE DUMBING DOWN OF CHORAL MUSIC . WAS RECENTLY AT A CONCERT OF A LARGE GROUP OF MALE MUSIC LEADERS IN MY STATE AND WAS TAKEN BACK AND SADDENED BY THE REPERTOIRE THAT I HEARD-A HUGE CHANGE FROM THE MUSIC HERITAGE OF THIS GROUP. I WAS AN ACCOMPANIST IN A CHURCH WHERE THE PASTOR ACTUALLY BANNED "MY ETERNAL KING". A CLASSIC IF YOU DON'T KNOW IT.IN OUR SEARCH TO BE RELEVANT,MUST WE CHECK OUR BRAINS AND ASSUME THAT PEOPLE CAN NO LONGER UNDERSTAND ANYTHING THAT HAS STOOD THE TEST OF TIME-NOT INTELLIGENT ENOUGH TO RELATE TO ANYTHING BUT SIMPLE DITTIES? IS THIS EVOLUTION IN REVERSE OR WHAT? I am a drummer and, sadly I have listened to this genre of music. Even more sadly I had a go at playing it with these Fundies I met to keep in practice. The trouble is THE TEMPO FOR ALL THESE SONGS IS IDENTICAL! It is a medium pace 4/4 about the speed of the Rolling Stones "Sway" without the swing or the feel. It was impossible to play it without A) Getting bored or B) Overplaying and putting in unnecessary fills in to keep awake and have something to do. It was rather likre working in a place where you had to look busy when there was nothing to do. Furthermore listening to the drums on CCM DVDs is no joke. You either have a horrid 80s electronic drum sound which sounds like New Romantic synthesizer bands or a big fat bloated stadiuum sound where the drums sound as echoing and vacuous as possible. Suffice to say I will not repeat this experience. Also this music has a racist pedegree. When rock'n'roll started these churches had "sin burnings" when they burned records of this "evil black mans music" as they thought the primal rythms would cause the flower of america's maidenhood would lose their virtue, start taking drugs and having fun. (Still do. )Songs by guys such as Little Richard were replaced with insipid versions by Pat Boone etc. as these were considered safe for white youth. After realising that making Church "hip" and "cool" and "contemporary" put bums on seats (and $ in pockets) the bullet was bitten and CCM emerged. Only trouble is that it is Bronze age idealogies tarted up with modern technology. It is for this very reason, all the back and forth, "we are right and you are wrong," that many ministers and worship leaders find it difficult to stay in ministry. I mean, who really wants to spend their days and nights defending every note, verse, song chosen, etc... when their heart is inclined to worship Almighty God? Besides, as Christians, we are supposed to strive for UNITY, but continue to divide and subdivide ourselves through petty and, quite frankly, unimportant arguments. Many of the same people who spend their days on earth defending their worship opinion never move a foot or hand towards actually doing the stuff of the Christian faith. Kind of makes one wonder what kind of real faith they have. I, for one, get so tired of the "vain repetition" of the Worship Wars argument, that I just want to give up and make a living doing ANYTHING but church ministry. Luckily, once in awhile, one can find a church to serve in that grows past this stuff. Harsh and uncharacteristic of most modern worship. David wrote, "Let everything that hath breath, praise the Lord." I have always taken this in its larger sense of inclusivieness of artistic (hence musical) materials, etc. Many of us have found that the blended worship style works best. A large number of modern hymnals now include CCM. There may be those who are happy using only German chorales or American folk music in worship. I prefer blending what is appropriate to expressw the theme of a worship experience from all the sources available. "Give of your best to the Master." If it's Wesley, so be it. If's Gaither, so be it. Etc. 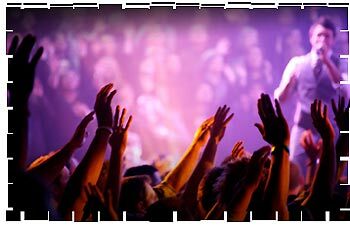 Here's my experience (as a church musician and worshiper), when I attend a completely CCM service, how do I know what to sing? Only the words are projected, never the music. Eventually one learns some of these new songs as they are repeated often enough. But until a CCM repertory is learned, CCM worship is just as alien to spiritual experience as so-called traditional worship. Years ago, while visitng San Francisco, I went my first Sunday to Glide Memorial Church. They were packed to the doors. They sang only CCM. There was an emotional feeling. And God was mentioned several times. The overall impression was that we were there to focus on ourselves rather than anything divine. The second Sunday I attended Grace Cathedral (Episcopal). The worship was exquisite and very well done. The overall worship experience was enhanced by having ALL the music that the congregationa sang printed in the margins of the oversize service bulletin. And the church was packed. And the Trinity was not only mentioned often but was the focus of the exercise. There is an entire worship genre called Davidic Worship. There are some good books on the subject. Even for the more traditional oriented worshiper (and worship planner), gradually introducing Davidic Worship elements seems to be adviseable. Whether it is "Silent Night" or "Lift up yourt hands in the sanctuary," there is a place for many aproaches to worship materials, styles, and expressions. We can all afford to expand our horizons. Please don't criticize people for no longer using songs that are from the 1800s. I am certainly glad we have gotten rid of some of the theology from that time. Good thought has grown. Slavery should be gone. And the thoughts and art of Christians should grow. The purpose of those hymns was to teach theology to illiterate people. That makes them good. Much of the music came from songs that were sung in bars, that's right bars. But, I agree with the article's focus much of christian music is just taking the words from the bible, and calling it more spiritual than writing their own art. That is not growing. The bible is public domain and all but why are we creating a bunch of Michael Bolton worship, "I didn't write it but I made it famous". Since when did the church (Big C church)stop caring about giving our best as a sacrifice to God. Learn to write well, then lead God's people well. Or use great art, for example, there are few songs as well written as The Old Rugged Cross, so we should still use it. Or the song "The Love of God" redone by Mercy Me, we should go do great songs like this. But don't take three sentences you stole from scripture and call it a song you wrote. It's satire. Let's all just calm down. I wont don't judge their music,And they explain it well..Lets just hope that they are not anti-christ. I'm a worship pastor, and to read this article and (some) of the comments definitely saddens me. Worship music, or music sung in church, is for the purpose of giving back, responding, to our Lord. The misconception I am seeing here is that we think the worship music is about us...it's not. When we worship we may be filled with the Spirit, and that is a blessing from God, but we should worship God through the good times and bad, through the hymns and contemporary songs, in response to what he has done for us and continues to do. If you find yourself judging the music while it's playing, whether it by hymn or praise song, perhaps it's not the song you should be looking at, but your heart. I lead all kinds of songs, including hymns, praise songs, repetitious songs and those with four or five verses. I get people coming up to me often saying they prefer one over the other, and I can say you will never please everyone. And that is okay. As long as I am teaching people in my church why we worship, and hopefully how to worship, it is okay if they don't like how many times we go through a chorus, because if their hearts are those of worship, it won't matter. Please don't let music divide you, or the argument of worship be the thing you war against, because as long as the devil has the church arguing against flesh and blood, and the meter and rhythm and repetition of songs, our eyes will be off the true battle, and we will not be worshiping. I found your article interesting and summarizes the situation perfectly. Thank you for sharing your knowledge. Thanks for supplying such an informative post. Maybe a Waffle House. Better yet Joe's Bar..